Hack's Pack Ute, Stadium Relay Event. Run to the fish pond bridge and back. CrossFit Games champions Rich Froning and Samantha Briggs. Affiliate Cup champions Hack's Pack Ute and Spirit of the Games recipient Kristan Clever. Watch the Live stream archives of the CrossFit Games [Domestic, International], and the Live CrossFit Games Update Show at 7:00 p.m. PT and a re-airing of the finals on ESPN2 at 8:00 p.m. PT. CrossFit Games Masters podium finishers. Tune in to the Live CrossFit Games Update Show at 9 p.m. PT along with continuous coverage on the Games site. Jordan Troyan, first place in The Pool event. Watch the Live Event Announcement, and then the Live CrossFit Games Update Show at 9 p.m. PT, along with continuous coverage on the Games site. Tune in to the Live Event Announcement at 7 p.m. PT and then the Live CrossFit Games Update Show at 9 p.m. PT along with continuous coverage on the Games site. Tabata score is the least number of reps performed in any of the eight intervals. Unit for the row is "calories". CrossFit Level 1 Certificate Courses: MBS CrossFit, CrossFit Park City, CrossFit HEL, CrossFit Chicago, CrossFit One, Peak 360 CrossFit, CrossFit Mayhem, CrossFit Columbus, CrossFit Central Downtown, CrossFit Ramsay, CrossFit STHLM (Stockholm), CrossFit Mundo, CrossFit 09, CrossFit Tuluka Pilar. CrossFit Coach's Prep Course: CrossFit Mundo, CrossFit Atlanta. CrossFit Kids Courses: CrossFit Max Effort. Scale as necessary, technique is the focus. CrossFit Level 1 Certificate Courses: CrossFit USD, CrossFit Country, CrossFit 5th Ave, NorCal CrossFit, CrossFit Verve, CrossFit Refinery, CrossFit Ann Arbor, Alamo CrossFit, CrossFit Colosseum, CrossFit the Royal Guards, CrossFit STHLM (Stockholm), CrossFit Rocks, Punk CrossFit, CrossFit Thames. 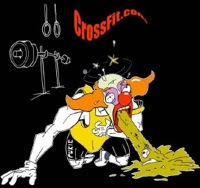 CrossFit Coach's Prep Course: CrossFit STHLM (Stockholm), CrossFit Belltown. CrossFit Kids Courses: CrossFit Firepower. We will not be open today, remember to thank those who help keep us free. Gym will be closed today and Friday to celebrate July 4th. BE SAFE. The Morning group of Bruins after "Brian Walker"